Expanded Polystyrene (EPS) geofoam is a super-lightweight material used in various transportation engineering applications. It has been particularly successful as an ultra-lightweight alternative to earthen, geosynthetic reinforced soil (GRS), and mechanically-stabilized earth (MSE) embankment systems when deployed as an approach embankment for highway bridges located atop soft soil sites. The goal of this study is to extend the application of EPS geofoam to that of directly supporting relatively lightweight bridge structures without the need of installing intermediate or deep foundation systems or using ground improvement to stabilize the foundation soils. This study evaluates the concept of using EPS blocks to support two-lane, single-span highways and pedestrian bridge structures under gravity and seismic loads. If the concept is successfully established, an EPS bridge support system might significantly contribute to accelerated bridge construction (ABC) technologies for certain classes and sizes of bridge structures. 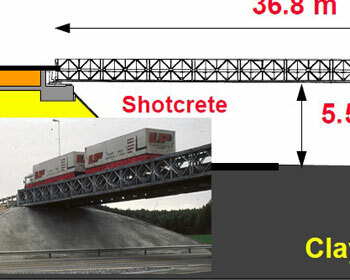 The deployment of this technology may lead to rapid and more economical deployment of bridge foundations for permanent and temporary bridge structures in areas plagued with soft ground issues that hamper or limit the use of conventional embankment and bridge support construction (e.g., large consolidation and post-construction creep settlement, low bearing capacity, poor construction conditions, relocation of buried utilities, and potential settlement damage to adjacent structures and foundations). Bartlett, Steven F., and Ramesh Neupane. Seismic Evaluation of Expanded Polystyrene (EPS) Geofoam Bridge Support System for Overpass Structures , MPC-17-328. North Dakota State University - Upper Great Plains Transportation Institute, Fargo: Mountain-Plains Consortium, 2017.